After a subdued performance in 2017 and the first nine months of 2018 being relatively flat, we expect Wheaton Precious Metals (NYSE: WPM) to end 2018 with 3.5% lower revenues compared to 2017. Lower silver revenue is expected to be a major drag on gross revenue. Silver accounts for almost 45% of WPM’s revenue. In such a case, after a volatile year for the players in the precious metals business, it would be interesting to know what could impact WPM’s stock by over 30% in 2019. 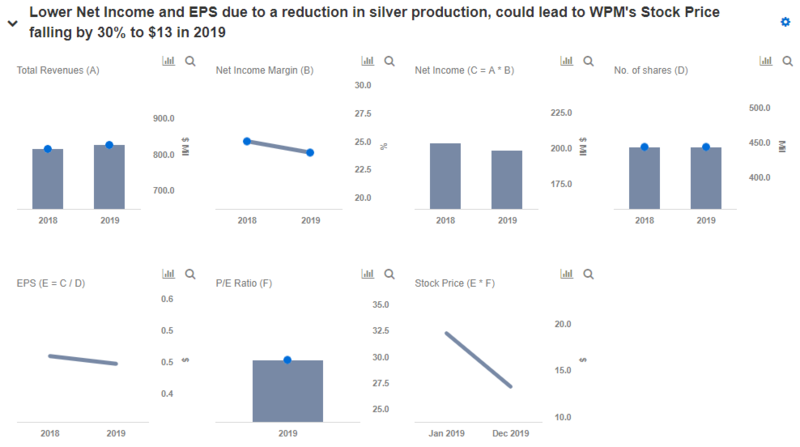 Our analysis shows that a 5% reduction in silver production (in case no purchases are made under the New San Dimas PMPA), assuming a stable international price level, would lead to a 30% drop in WPM’s stock price in 2019. You can view our interactive dashboard – The Factor That Can Significantly Affect Wheaton Precious Metals’ Stock In 2019 – and make changes to the assumptions to arrive at your own price estimate. WPM saw a reduction in silver ounces sold in 2018 due to expiry of the streaming agreement related to the Lagunas Norte, Veladero, and Pierina mines in March 2018, which was further exacerbated by the termination of its San Dimas silver stream. In May 2018, following the acquisition of all common shares of Primero by First Majestic, WPM decided to terminate the San Dimas silver purchase agreement with Primero and enter into the new San Dimas Precious Metals Purchase Agreement (PMPA), also called First Majestic PMPA. Under the terms of the new agreement, for which WPM paid a total upfront cash consideration of $220 million, the company is entitled to an amount equal to 25% of the payable gold production, plus an additional amount of gold equal to 25% of the payable silver production converted to gold at a fixed gold to silver exchange ratio of 70:1. The biggest risk that WPM faces in the future is not being able to purchase any further gold or silver under the PMPA. Even in such a situation, there is no assurance that Wheaton would be successful in enforcing its rights under the security interest granted by First Majestic or its other remedies under the San Dimas PMPA. If the company is unable to purchase any gold or silver under San Dimas PMPA, its reserves and resources would be significantly reduced, and the Company’s average five-year forecast silver equivalent production would be lowered by 5%, leading to a corresponding reduction to its revenue, net earnings, and cash flows. We forecast WPM to sell about 23.0 million ounces of silver in 2018. In the above scenario, a 5% drop in silver output would take silver volume to 21.9 million ounces in 2019. Additionally, silver prices were headed south in the second half of 2018, mainly due to a strong dollar which reduced investors’ interest in precious metals. Thus, at a price of $16.10 per ounce of silver sold, the total silver revenues would see a decline of 11.3% to $353.5 million in 2019. Though the price of gold also took a hit towards the end of 2018, higher production and volumes would likely offset the price decline and the segment is expected to post higher revenue in 2018 and 2019. Increase in gold revenue would offset lower silver sales helping WPM post revenue of $825.6 million and EPS of $0.45 in 2019. Though EPS seems to be flat when compared to 2018 expected EPS ($0.46), it signifies a sharp drop from the trailing twelve-month EPS (ended September 30, 2018) which is $0.64. A projected EPS of $0.45 and P/E ratio of 29.7 would give us a fundamental stock value of $13.37, which is 30% lower than the current market price of ~$19.00. Thus, our valuation and analysis point out that the way WPM is able to take advantage of the new San Dimas PMPA could be of great significance in determining the movement of its stock price. In case of the desired level of production not being achieved, WPM’s stock could decline by as much as 30% this year. Visualize Related Companies: Wheaton Precious Metals , Alcoa , Cleveland-Cliffs Inc.